How to Make a Portable Lie Detector Circuit and Its Working? 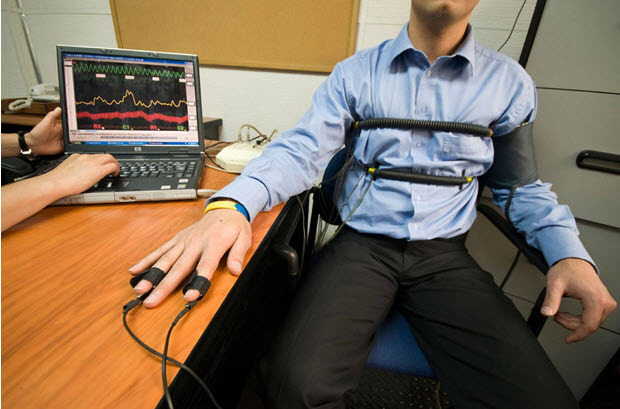 The Portable Lie Detector is a device which detects persons, who were telling lies based on the vibrations in their voice. These were developed by using “theory of polygraph”. When any person lying, the pitch of that person’s voice may raise, or it may stutter, these unusual changes will be identified by the lie detector, by considering the voice pattern change from silent to nervous. This kind of portable lie detectors were being developed by Lafayette Instrument Co and Johns Hopkins University. It was deployed to the US Army in Afghanistan during the year 2008. Most commonly in airports Skin-flush lie detection is used and this will track blood flow in the face and body using thermal cameras. Bradford University and Aberystwyth University developed lie detection system. This system had grabbed plenty of publicity in Britain. A fully integrated lie detector called the Embodied Avatar Kiosk is being tested at US border posts. The ATM-sized kiosk, developed by a consortium led by the University of Arizona, interviews travellers Max Headroom style. Infrared cameras, standard cameras, microphones and touch screens analyse the responses and alert the border security personnel to suspected lies. You don’t have to look beyond home to find all the components needed for a lie-detector. The Xbox One game console with the latest Kinect sensor is equipped with a hi-res camera, infra-red camera and multiple microphones. It has voice controls, performs face recognition and can track fine body movements, gestures and eye movements. By combining inputs from the standard and infra-red cameras, it can analyze the skin-flush in your face to accurately monitor heart rate for sports games. Can we utilize it, to infer lies? Definitely, we can by applying the right software. Computing developments continue to follow steep exponential curves and Moore’s law says it won’t be long before all the requisite sensors and processing power can be packed into a palm-sized device. We already knew that smart phones are made, capable of on-board voice processing. Before long we’ll download serious lie-detector apps (there are already toy ones) to listen in on calls to our boss, or our customers, or lovers. There is, of course, a whole frontier in lie detection I haven’t touched on. Here I would like to mention neuroscience, brain imaging and memory mapping. Suffice to say that the latest memory imaging research at Carnegie Mellon is profound. The schematic circuit diagram of the Lie Detector is shown in the below figure. This entire system consists of three transistors TR1, TR2 and TR3, two LED lights L1 & L2, a capacitor C, five resistors R1, R2, R3, R4 & R5 and finally a variable resistor VR1. A small NPN transistor and other transistors like BC547, BC548 or BC549. Depending on the changes in the person’s skin resistance i.e if they sweats, it means they were lying. This is how the Lie Detector circuit works. Let us have a look into the circuit in which the Resistors R1 and R2 form a voltage divider and it contains resistances of 1 000 000 ohms (1 meg ohms). Those values will be equal as the voltage at the upper probe wire is half the battery voltage i.e., nearly 4.5 volts. Transistors TR1 and TR2 act as a voltage comparator. If the voltage at the base of TR2 is higher than at the base of TR3 then the green LED (L1) will come on. If the reverse is true then the red LED (L2) will light. Capacitor C1 works in a smooth way and it eliminates the 60Hz induced mains which is noticed on the body of person. 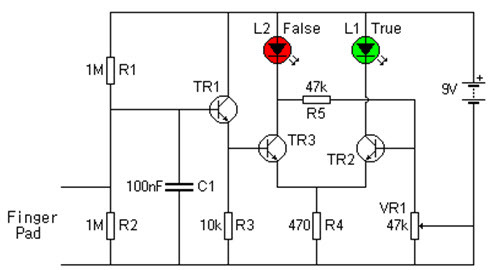 TR1 and R3 form a buffer circuit which is called an emitter-follower. The voltage at the emitter of TR1 follows the voltage at the probe wire. This will be capable to drive transistor TR2. The resistance of dry skin has about 1 million ohms and the resistance of moist skin will be reduced by ten factor or even it may be more.In order to test this Lie Detector you should hold the probe wire ends and now VR1 is adjusted till the green LED is on and the red LED is off. At this point, the voltage at TR2 base will be more than TR3 base. Later you have to use moist fingers to carry the probes. This decreases the resistance of the skin and makes the voltage at TR2 to drop. The voltage at TR3 base is more and the red LED will be on. A person holding the lie detector probe wires will change the voltage at the upper probe wire depending on the skin resistance. The skin resistance is in parallel with R2 and, because it is likely to be similar to or smaller than R2, the voltage at the probe wire will lower as skin resistance drops. The Lie Detector requires adjustment before it is used and the detector needs adjustment for every person as the nature of the skin differs from person to person.By touching the two probe wires against the palm of dry hand and the metal ends are not supposed to touch each other. Tune the control VR1 until the red light (FALSE) goes OFF. Now the Lie Detector is now adjusted for person’s skin type. If touch the wires against the palm the red light will be ON. We have to know how the Lie Detector is used to identify real lie. In order to know the lie, you have to touch the two probe wires against the palm and adjust the tuning control as before until the red light just goes out. If the person lies and begins to sweat the red light will show brighter light. 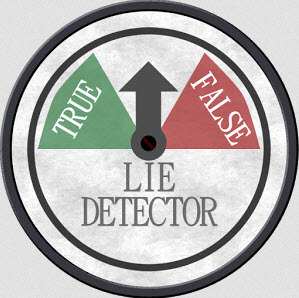 But the Lie Detector does not detect every lie because it detects only when the person is sweating. When the person pretends then the detector don’t show any effect. It is the first voice recognition technology in the Worlds which had been placed on an IC chip. 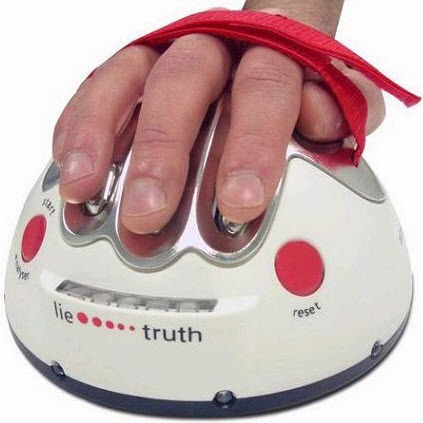 This lie detector is easy to use and it gives results instantly. By noticing the tension in the voice the Detector shows whether the person is telling the truth or not. Therefore, this is all about lie detector working and its specifications and that is developed by using the theory of polygraph.Furthermore any queries regarding this article or electronics projects you can contact us by commenting in the comment section below.